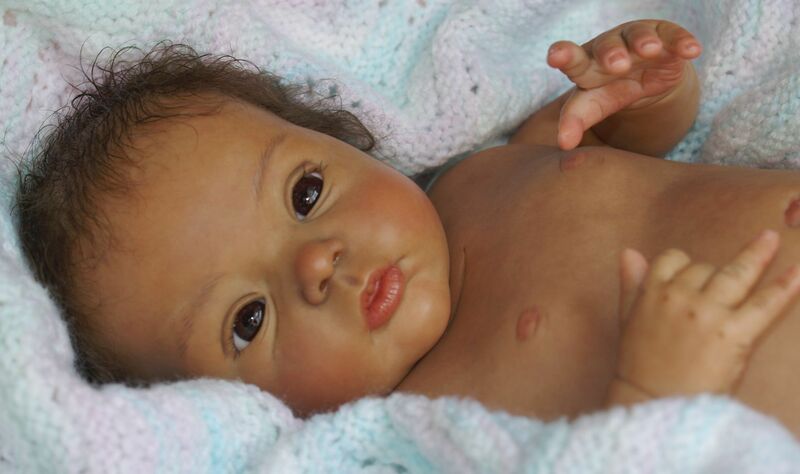 Can you believe this is a doll? This is “Aisha,” 🙂 by artist Gudrun Legler. See more of her work here. The other day, the boy and I were chilling out front with my father when my neighbour’s son rolled through the ‘hood, wife and baby girl in tow. Greg and Jeanne are an interracial couple as well, but the inverse of the boy and I. Greg is black and she’s white. Their daughter, Arianna, is such a sweet pumpkin. I immediately grabbed her, and Jeanne seemed to be happy to have her hands free for a bit. The boy recently had a dream that we’d had a baby girl, and as I cooed and fussed over five-month-old Arianna, I could feel him watching me. I walked over to where he was sitting. “Was our dream-baby as cute as this one?” I asked quietly, bouncing her in my arms. He smiled at her giggles. “Huh,” I said. I made the “not bad” face. As Jeanne enjoyed a beer with the fellas, I walked around the perimeter of the driveway with Arianna. She’s so cute. I found myself taking in her skin tone and the darkness of her eyes and lashes as compared to the surprising medium-brown of the hair on her head. She had a fair amount of it, too. Not a lot, but enough. Fluffy, soft curls. I brought face down and kissed the top of her head, inhaling her sweet baby scent. The guys guffawed while Jeanne and I just rolled our eyes. weekend wrap-up: bits and bites.